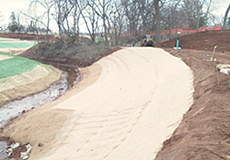 Get full-service erosion control and site stabilization for your property from Wildlife Solutions, Inc. with silt fencing, hydroseeding, mulching, matting, and sodding. When you get sod from us, it comes from numerous sod farms within a few miles of our corporate office. The sod you get is cut fresh and delivered and installed on the job site all on the same day. You can get most popular species of sod, including Bermuda, Centipede, St. Augustine, and Zoysia. Get DOT Class A and Class B silt fencing from us. No job is too large or small. Whether it’s installation for an open construction area, ROW, or remote site, you can depend on our manpower and experience to get the job done. 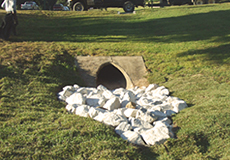 Put a stop to erosion with hydroseeding. 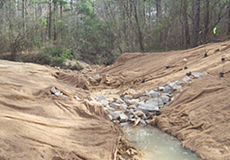 Rely on us when you need an erosion crew that specializes in getting to hard-to-reach areas and steep slopes using only the best quality seed, fertilizer, mulch, and tackifier. Get mulching with top-quality hay blowing equipment and hay, typically from 65-pound bales, to cover sites with fertilizer and seed. 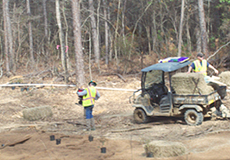 A straw crimper helps to stabilize and protect the site until the grass is established. The professionals at our licensed and insured business install thousands of rolls of matting annually from double-sided straw and excelsior matting to the heavier and more durable coconut matting on steeper slopes.